Update: May 2015 – I have been using this rug daily since I made it and have washed it several times in the washing machine using cold water. It needs to then be laid flat and air dried. Still looks great and has held up well. Hoooked Zpagetti is big, fun t-shirt material yarn that gave my biggest crochet hook some much needed exercise. I needed a new throw rug and I couldn’t find what I wanted in stores. When I saw Zpagetti at the Japan Hobby Show I knew I’d found my rug! 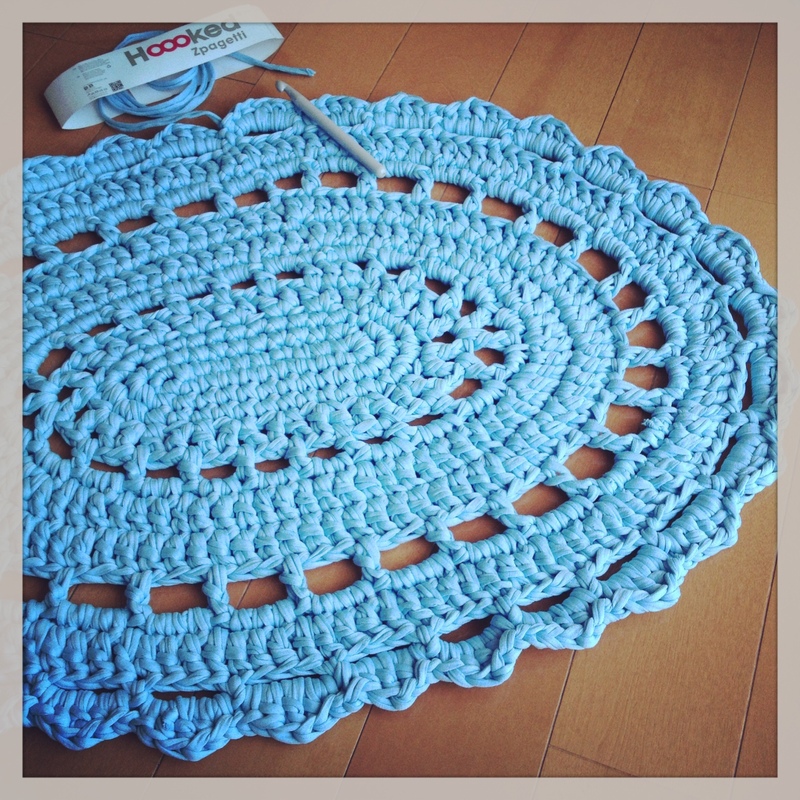 With one skein of their light blue Zpagetti and 5 hours of Shonan-Shinjuku Line train time ahead of me, I started on my rug. Without a pattern. Just an oval silhouette idea and 120 meters to get it done. Working on the train is very cathartic for me. No one is asking for me to make them dinner, nor is the laundry screaming to get done and it helps me focus on my task at hand. Very few people bother me and only the very, very brave will ever ask what I’m doing. Starting from the center of the skein, the t-shirt yarn did perform exactly as I expected, very comfortable on my hands and heavy. The yarn was quite twisted in the beginning and had to do some spin my piece once in a while but the twisting became less as used more and more. There were at least 4 knots in my 120meter/131yard skein with one end that needed to be tied. The next day I finished the last 20% and came out a yarn chicken winner with only 1 meter of zpagetti yarn left! Final rug size is 29″ x 21″ (74cm x 53) exactly the size needed for the space I want to throw it. This serendipitous project became very economical in that it came out the perfect size and I don’t have any leftover yardage to store. Now if life could take a lesson from this crochet project and go as wonderfully, smoothly each day for all of us! Lovely! I’d like to make a rug out of t-shirt yarn. I made a cat nest a while back; I found crocheting with the yarn made my arms ache.